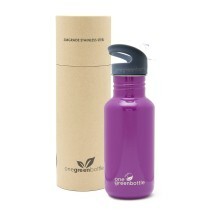 Tough and durable 500ml stainless steel bottle in stunning magenta. Perfect for school and commute. This bright coloured bottle stands out from the crowd – lightweight, small and easy to bring anywhere. Bottles are supplied with the limited edition GREY Quench cap. We recommend handwashing painted bottles. with or without the internal straw part.